So in Mary Kate’s inaugural kitchen story post she asked what the workhorse pieces in your kitchen are and if they had a history. 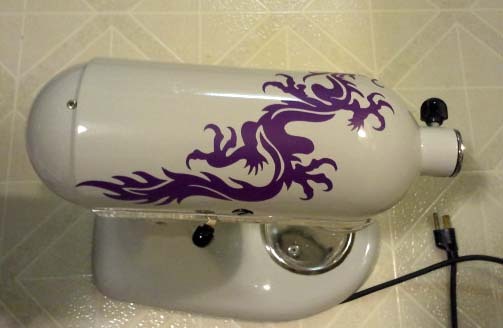 My workhorse piece is my KitchenAid mixer. And it does have a bit of a story. When I was a kid (there’s some debate over the exact age, I thought it was around 15, but my mother claims it was before that, maybe 12 or 13), my father decided to buy a KitchenAid mixer for my mother for Christmas. Now, this was mostly because my dad’s friend had bought one for his wife, and my father was a “Keep up with the Joneses” kind of guy. Keep in mind that my mother was working 10 or 12 hours a day, she wasn’t all that interested in cooking anyway, and I was basically responsible for getting dinner on the table at that age already. To complete the picture, my mom has often said that she made a pie once before I was born, just to say that she could do it, and that was enough. So a KitchenAid mixer wasn’t an appropriate gift for my mom in any stretch of the imagination. I tried to explain this to my father while we were shopping. He didn’t listen, because that was not his thing anyway, and I have to admit that I didn’t try as hard as I could have to convince him that it was a stupid gift for my mother because. . . it was a KitchenAid mixer! (Cue heavenly chorus.) I knew that the use of the said KitchenAid mixer would default to me, as the main cook in the family. So sue me, I let appliance lust sway me from the straight and narrow path of insisting that my father pick a Christmas gift that my mom would actually like. The KitchenAid mixer was purchased, and as predicted by me, my mother wanted nothing to do with it. So I used it during the years before I left for college. I didn’t take it with me because there really wasn’t a place you could stash a KitchenAid mixer in the dorm rooms at Wellesley, although I did have a food processor for making strawberry daiquiris. During my second year of law school, my mother finally decided to get a divorce. Let’s just say it was not a shock to anyone, and it was certainly about freaking time. When she told me she was moving out of the house, I told her that she needed to take the KitchenAid mixer. She was puzzled and said that she didn’t want it. I said, “I know you don’t, but I do.” She took the KitchenAid mixer, and since I was living in an apartment at that time, the KitchenAid mixer and I have been happily together since. I’m now 42 and my relationship with the KitchenAid mixer since its purchase has lasted either 27 or 30 years depending on who’s memory is accurate (maybe my sister will weigh in for a tie-breaker). So I ordered the materials and waited for them to arrive. When they did, I spread newspaper out on my kitchen floor, and got my Kindle Fire out so I could watch the video over and over again as I did the repair. It took me about an hour, just because I was working so carefully and slow to make sure I did it right, and I wanted to remove as much of the decades old grease as I could. When I got it back together, it worked like a charm. No leaks, no drips, no nothing. 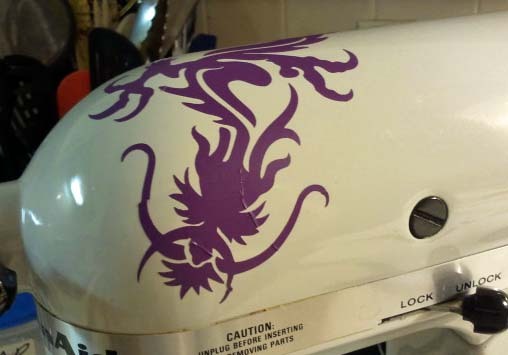 To celebrate, and to make up for contemplating replacing it for a younger, hotter, and purple model, I got it a purple dragon decal (go here on etsy, but she’s on vacation until July 5) to match my dragon tattoo. Here’s hoping for another thirty or so happy years!